A leader among Indian states in terms of industrial production, agriculture and commerce, Maharashtra occupies the western and central part of the country. Mumbai, the state capital and the commercial hub of India, is the growth engine of the country. Maharashtra has a long coastline stretching nearly 720 km along theArabian Sea. One of the most prominent features of Maharashtra is the Deccan plateau, which is separated from the Konkan coastline by the towering Western Ghats. The Ghats are a range of steep hills intermittently bisected by narrow roads. Most of the famous hill stations in the state are at the Ghats. The Western Ghats also known as the Sahyadri Mountain range provide a physical backbone to the state on the western front facing the Arabian Sea. The Western Ghats run parallel to the coast at an average elevation of 1,200 metres (4,000 feet). Kalsubai, a peak in the Sahyadris, near Nashik city is the highest elevated point in Maharashtra. To the west of these hills lie the Konkan coastal plains, 50 - 80 km in width and to the east of the Ghats lies the flat Deccan Plateau. In the north side, the Satpura Hills and Bhamragad-Chiroli-Gaikhuriranges on the east serve as the natural borders of the state. The state is surrounded by Gujarat to the north-west, Madhya Pradesh to the north, Chhattisgarh to the east, Telangana to the south east, Karnataka to the south and Goa to the south west. Maharashtra is the third largest state (3 lakh sq. km) in India with a coastline of 720 km along the Arabian Sea. Forests comprise 17% of the total area of the state. A majority of the forests are in the eastern and Sahyadri regions of the state. 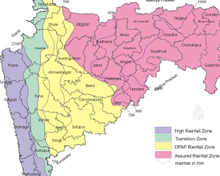 The main rivers of the state are Krishna, Bhima, Godavari, Tapi-Purnaand Wardha-Wainganga. 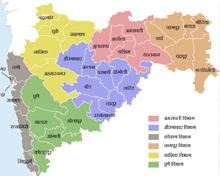 Vidarbha is the easternmost region of the state, formerly part of Central Provinces and Berar. 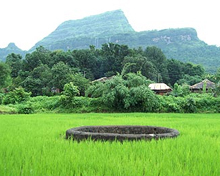 Sahyadri range, with an elevation of 1,000 meters, is known for its crowning plateaus. Lying between the Arabian Sea and the Sahyadri Range, Konkan is narrow coastal lowland, just 50 km wide and with an elevation below 200 meters. This lowland region is known for beautiful landscapes rich with flora and fauna. While Kandesh in the north-western region is sparsely populated with cities like Jalgaon, Dhule and Bhusawal. Desh is bounded on the west by the Ghats or Sahyadri range, on the north by the Kandesh and on the east by the Marathwada regions of Maharashtra, and on the south by the state of Karnataka. The region is hilly and slopes towards the east. Desh is drained by the upper reaches of the Godavari and Krishna rivers and their tributaries. 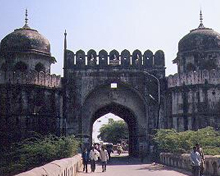 Marathwada region (formerly a part of Hyderabad state) that merged with then Bombay province in 1956 has important districts like Aurangabad and Nanded. Nagpur, where the winter session of the state assembly is held, and Amravati are the main cities in the Vidarbha region. Satpura hills along the northern border and the Bhamragad-Chiroli-Gaikhuri ranges on the eastern border form natural barriers for the state thus preventing easy movement. Maharashtra has a monsoon climate with hot, rainy and cold weather seasons. However, dew, frost and hail also occur sometimes, depending upon the seasonal weather. The winter in January and February is followed by summer between March and May and the monsoon season between June and September. During summers from March to May, day temperatures reach their peaks with high humidity levels. There is possibility of thunderstorms in the state during April and May. Temperature varies between 22 °C and 39 °C during this season. Rainfall starts normally in the first week of June with the arrival of south-west monsoon. July is the wettest month in Maharashtra, while August also gets substantial rain. Monsoon starts its retreat with the coming of September to the state. Winter season is a cool, dry spell, with clear skies and gentle breeze. A pleasant weather prevails from November to February. But the eastern part of Maharashtra sometimes receives rainfall. Temperature varies between 12 °C and 34 °C from November to February across the state. Rainfall in Maharashtra differs from region to region. Thane, Raigad, Ratnagiri and Sindhudurg districts receive heavy rains of an average of 200 cm annually. But the districts of Nasik, Pune, Ahmednagar, Dhule, Jalgaon, Satara, Sangli, Solapur and parts of Kolhapur get rainfall less than 50 cm. Rainfall particularly concentrates at the Konkan and SahyadrianMaharashtra (the region of Western Ghats). Central Maharashtra receives less rainfall. However, there is a possibility of heavy rainfall due to the influence of Bay of Bengal in eastern Vidarbha from August to September. Forests cover less than one-fifth of the state and are confined to the Western Ghats, mainly their transverse ranges, the Satpura range in the north, and the Chandrapur region in the east. On the western coast and adjoining ridges, plant forms are rich with lofty trees, variegated shrubs, and mango and coconut trees. The forests yield teak, bamboo, myrobalan (for dyeing), and other woods. Thorny savanna-like vegetation occurs in areas of lesser rainfall, notably in upland Maharashtra. Subtropical vegetation is found on higher plateaus that receive heavy rain and have milder temperatures. Bamboo, chestnut, and magnolia are common. In the semiarid tracts, wild dates are found. Mangrove vegetation occurs in marshes and estuaries along the coast. Wild animals include tigers, leopards, bison, and several species of antelope. The striped hyena, wild hog, and sloth bear are common. Monkeys and snakes occur in great variety, as do ducks and other game birds. The peacock is indigenous. 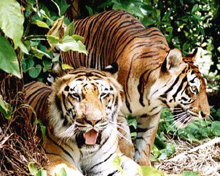 Many of those animals can be viewed at the state's wildlife parks at Tadoba, Chikhaldara, and Borivli. The state's abundant marine life in the waters off the western coast remains largely unexploited.